Last week I had an “Undelivered Mail” message bounced back email for an email I sent to a good mate of mine. A bit strange, but I just figured it was one of those things that happens now and then, maybe an over zealous SPAM filter or something at his end. So I re-sent the mail, letting him know that he possibly had a problem, and didn’t think any further of it. A few days later I hadn’t had a reply, but we ended up actually conversing via phone anyway, imagine that, a real conversation with audio, whatever will they think of next! That evening I got a second bounce, Gordon definitely had a problem! Then yesterday I had to call someone because they hadn’t responded to an important email I sent last week, they said they hadn’t received an email from me. Hmmm, that’s curious, but I’ve had problems with this particular person having “not got the email” before, so I just figured they were up to their old tricks. Then this morning I got a couple of Undelivered Mail messages into my FogBugz server. This happens every now and then when a SPAM mail slips through the FogBugz SPAM filters and the auto-response gets bounced. But this time there were no SPAM messages in my inbox, so I took a closer look at the two error reports. The first was indeed a bounced auto-response, but I recognised the email address, it was for someone who’d been using the CaseDetective trial and had a couple of questions. That’s not good, why did that email fail? The second was an email that I’d sent to that same person in answer to their questions, which apparently they never got the answers to. Oh dear. On closer inspection it looked like an outfit called SORBS had bounced the emails because the IP address of the sending server is on a dynamic IP address. A quick check of their database showed that my IP address was in their list of dynamic IP addresses that should not therefore be sending email (there’s a link in the error message that included my IP address). Now, I have a static IP address, it’s one of the reasons I’m with the ISP I’m with, I need a static IP address for hosting my FogBugz server as it harvests automatic bug reports submitted by my customers through ScountSubmit directly from CaseDetective. I also like my static IP address because I can access my email on my little server through SquirrelMail when I’m away from the office etc. So, SORBS has got it wrong, and for them to change their mind I have to get my ISP to get in contact with them and put them straight. So I logged a support request with my ISP, and they quickly responded to clarify the situation, an are now going to get in touch with SORBS to get the IP address block I’m on removed from their dynamic IP address database. But it could take several days for it to happen. Bugger! The support guy at my ISP didn’t have a very high opinion of SORBS, and I can see why, their policy of blocking dynamic IP addresses is all very well, I can see the logic in what they are doing, but if you’re going to do something so severe you’d better get it bloomin’ right, or else you’re going to piss off a lot of innocent bystanders, such as people like me! After a few tests and much perusing of raw email headers I deduced that although my email server was set to use my ISP’s relay host, it wasn’t doing so, my email server was definitely sending email direct. Double bugger! A quick search of the Apple support forums came up with another person with the same problem, and a response that there seems to be a bug with the Mac OS X Server Admin GUI when writing out the config file for postfix. It seems that the Server Admin app is setting the relayhost variable to blank, which means the mail server can obviously only go direct when sending mail out. I stopped my mail server, quickly edited postfix’s main.cf file to set the relayhost variable to my ISP’s host, started my mail service again and ran a quick test … job done, mail is now being routed via my ISP’s relay host. So apologies to those who didn’t get expected emails in the last week, and a special apology to those who’ve now just got an email from me dated sometime last week! Posted by ianmjones at 10:03 pm on July 18th, 2006. We’re back from our two week holiday to Yorkshire, East Sussex, Wiltshire, and Lancashire. In those two weeks we clocked up over 2,115 miles in the car, and I dare say we added a good portion of those miles while going up and down dale and around in circles in spectacular Herriot country. We loved our time in Yorkshire and are already planning to go back soon. East Sussex was great, that’s where I was born and spent my formative years, and is where the majority of my family is. I don’t see my family anywhere near as much as I’d like, so it was very nice to have a few days to visit. Even though we had 5 days in East Sussex, time seemed very short and I wish we could have spent more time there. Did however have time to get a new tyre for the car as somewhere along the way we’d picked up 4 punctures in just the one tyre! We spent a glorious day at Longleat where we saw the fantastic house, Lord Bath’s amazing murals (an open mind required), and some wonderful wildlife in the safari park. 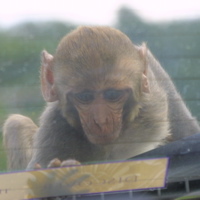 The cheeky monkeys stripped off with my rear windscreen wiper rubber and ran off with the rear wash nozzle, so there’s yet more expense for the car. But they had a hard time getting to the sticker on the inside of the window! It was then up to Liverpool, where we visited some family and friends in Southport and Crosby, but just like the rest of the holiday time seemed too short and soon we were enjoying a very pleasant last evening dining outside a restaurant in Liverpool’s Albert Dock as the sun set. And so to Monday morning and my first proper day on the new contract, which has been very good and surprisingly productive, with all software installed, dev environment set up, source checked out and built and some time spent familiarising myself with the application. I also got started reading the requirements specification for the project, it definitely looks as though I’ll have plenty to keep me busy for the forthcoming year! Now it’s back to trying to schedule my spare time to enable me to continue to develop CaseDetective as well as have some semblance of a family life and time to relax. I’m going to experiment with a few ideas on that front, I’ll post about it as and when I have time! Posted by ianmjones at 8:56 pm on July 3rd, 2006.